The National Crucian Conservation Project (NCCP) is celebrating the creation of yet another bespoke crucian and tench water thanks to the vision and hard work of Wimborne and District Angling Club with help and funding from the Angling Trust and the Environment Agency. 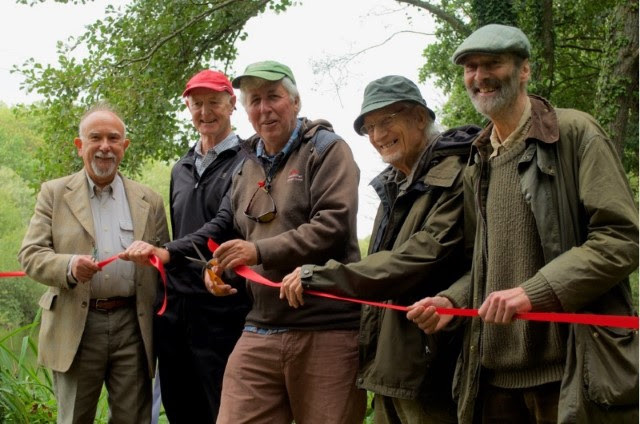 A celebratory day, organised by film maker and long-standing club member Hugh Miles, marking the restoration of the Upper Pinnock Lake at Edmondsham took place last week with special guests including: ‘Crucian Guru’ Peter Rolfe, Club Vice-President and Passion for Angling star Chris Yates, and Angling Trust Campaigns Chief Martin Salter who was given the job of cutting the ribbon and catching the first fish for the cameras. Upper Pinnock Lake was a former trout fishery, originally opened forty years ago, and is fed by the nearby River Crane. It had become badly silted up over the years and was in danger of disappearing altogether. Club Secretary Stuart Hitchman led the charge to bring the water back to life and applied for two separate tranches of funding totalling £30,000 from the Angling Improvement Fund under the guidance of Dean Asplin and Mark Wilton from the Angling Trust. These grants also covered improvements to other club waters including the provision of tool storage sheds, on site toilets, new swims and gravel pathways together with major improvements to help the less able. 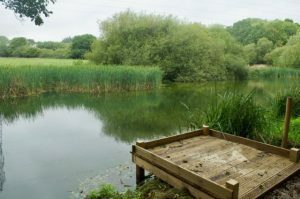 The lake at Edmondsham was dredged and the silt removed, eight brand new, disabled-friendly fishing platforms were installed and the EA’s fish farm at Calverton provided 300 pure bred one-year-old crucians to go with the tench that the Club had purchased as a ‘companion fish’ for the crucians on the advice of Peter Rolfe. Win A Bivvy Worth £299.99! !